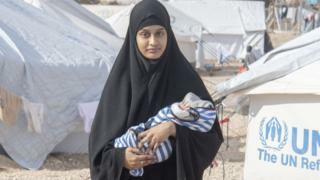 Home Secretary Sajid Javid is facing criticism after the baby son of Shamima Begum died in a Syrian camp. Ms Begum left London to join the Islamic State group aged 15. Mr Javid revoked her British citizenship when the teenager asked to return. A family friend said the UK had failed to safeguard the child while Labour said his death was the result of a "callous and inhumane" decision. A UK government spokesman said the death of any child was "tragic". Ms Begum, who left the UK in 2015 with two school friends, was found by a journalist from the Times in a Syrian refugee camp in mid-February. She said she had been living with her husband, a Dutch IS fighter, in IS's last stronghold and had previously lost two children, blaming the inhospitable conditions. Nine months pregnant, she told the paper she did not regret joining IS, but that she felt the "caliphate" was at an end. And speaking shortly after the birth of her son, Jarrah, she told the BBC she wished her child to be British and to be raised in the UK. Jarrah died of pneumonia on Thursday, according to a medical certificate. He was less than three weeks old. Conservative MP and former justice minister Phillip Lee urged the government to "reflect" on its "moral responsibility" for the tragedy. He said that despite her "abhorrent views" the decision to remove Ms Begum's citizenship - and therefore deny her the chance of returning to the UK - seemed "driven by populism and not by any principle I recognise". Conditions in the camp were "pretty appalling", with a shortage of food, blankets and tents, said the BBC's Middle East correspondent Quentin Sommerville. Defence and security editor for the Daily Mail Larisa Brown told Newsnight there was no form of heating in the camp and the tents did not have stoves to keep children warm in temperatures that fell to 3C or 4C at night. In three months, more than 100 people have died on the way or soon after arriving at the camp, with two-thirds of those dying aged under five. David Miliband, former foreign secretary and president of the International Rescue Committee, said the camp faced an emergency as 12,000 "traumatised as well as deeply malnourished" people fled IS rule. Dal Babu, a former Metropolitan Police chief superintendent and friend of Ms Begum's family, told BBC Newsnight: "We've failed, as a country, to safeguard the child." Ms Begum's sister, Renu Begum, said in the letter Jarrah was the "one true innocent" in the situation. "This was an entirely avoidable death of a British citizen," said Mr Babu. Shadow home secretary Diane Abbott also criticised the actions of the Home Office. She tweeted: "It is against international law to make someone stateless, and now an innocent child has died as a result of a British woman being stripped of her citizenship. This is callous and inhumane." Speaking to the BBC on Friday, before it was confirmed that the baby had died, Mr Javid said: "Sadly there are probably many children, obviously perfectly innocent, who have been born in this war zone. "I have nothing but sympathy for the children that have been dragged into this. "This is a reminder of why it is so, so dangerous for anyone to be in this war zone." "Working with the Red Crescent there for example, it should be possible to go and get people from the camps - if there was a political will." "It is possible the death of this baby boy and others could have been avoided. The UK and other countries of origin must take responsibility for their citizens inside north-east Syria," she added. But Professor Anthony Glees, director of the Centre for Security and Intelligence Studies at the University of Buckingham, said: "The responsibility for this tragedy lies with the so-called Islamic State." 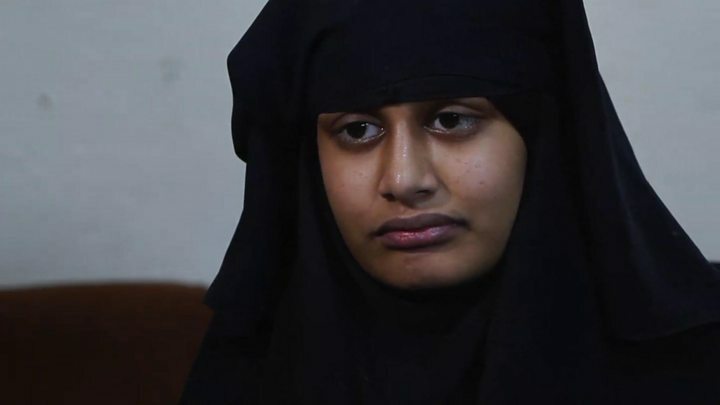 He said Shamima Begum also bears responsibility "for making the choice to leave the safety of the United Kingdom and go and be a Jihadi bride". She added that she had never sought to be an IS "poster girl". "I just want forgiveness really, from the UK," she told the BBC's Middle East correspondent Quentin Sommerville last month. "Everything I've been through, I didn't expect I would go through that.